A couple of days we talked about when the right time is to hire a bookkeeper and now I want to talk about the right time to hire a CPA. If you didn’t read last week’s post about the difference between a bookkeeper and a CPA, be sure to check it out. I’m a firm believer that a CPA can make a huge difference when it comes to filing your taxes. Tax Law is crazy and it changes – CPA’s keep up with all of that stuff and they know what way you should be filing, what credits you can take to benefit you and your business and can even advise on extra deductions you can take. We all know that tax day here in the US is April 15th. So, when should you hire a CPA? April 10th? In January? When is the right time? I spoke with Amy Northard, CPA who is an awesome CPA just for Creatives and she answered some of these questions for us! – Do I need a CPA only at tax time or should I consult with a CPA throughout the year as well? It’s important to stay in touch with your CPA throughout the year so you can plan for the upcoming tax season by paying quarterly taxes. This is also a good time to discuss tax savings strategies like retirement contributions so you can start setting money aside throughout the year instead of being bombarded with tax and retirement payments all at once when you file your tax returns. – Why should I hire a CPA to do my taxes instead of just doing them on my own? It’s important to work with a CPA instead of doing your taxes on your own because CPAs have gone through extensive schooling and testing on the topic as well as completing at least 40 hours of continuing education each year to keep up with constantly changing tax laws and regulations. By working with a CPA who’s familiar with your business niche (ex: wedding planners, photographers, florists), they will know what questions to ask in order to maximize your allowable deductions. – Do I need to hire a CPA that is in the same state as I am in? Thanks to the CPA mobility rules, CPAs in good standing are allowed the privilege of practicing in most other states without applying for an additional license in that state. This means you can work with a CPA who lives in a different state. Thanks to the internet and the ability to look up state-specific information, an accountant in Indiana can research California tax issues and provide assistance. When debating whether or not to use an accountant in a different state, keep in mind your personal preferences. Do you like to work with people face to face or are you comfortable having a Skype call and figuring things out over email. – At what point in the year should I start thinking about my taxes and start consulting with a CPA? It’s never too early to start planning for your taxes. By knowing how much to save or pay in towards your taxes, you can avoid the stress that tax season is known for. If you’re feeling good about the money you have saved for taxes and just want to get on a CPA’s client list for tax time, I’d start reaching out to accountants between November and early January. After that, they’re swamped with tax return preparation and may not be taking new clients for the tax season. You see, you definitely don’t want to wait until the last minute to hire your CPA because the more time that have to get to know your business, the more time they have to think about the credits and deductions that will benefit you. The more time they have the better tax strategy they can come up with for you. Be sure to ask around and choose a CPA that specializes in your field. Not all CPA’s are created equal and you want yours to not only understand the way your business operates but also enjoys working with businesses your size. A CPA that typically services large retail businesses probably isn’t the best option for a small to mid size photography business. Take advantage of any free consultations they might offer so you have a chance to get to know their personality. It’s important that they speak to you in a way that you understand so you’re not feeling lost or confused when they start talking to you about that tax strategy. If you’re thinking about hiring a CPA for your 2016 taxes, now is a great time to reach out to someone like Amy and get your questions answered and a get a tax strategy in place. 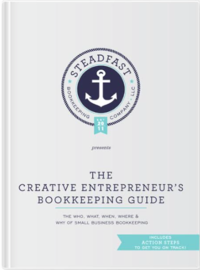 « When Should I Hire a Bookkeeper?